It’s been a while since I’ve written a weird food blog, but since people occasionally ask after them I’ve decided to bring it back. 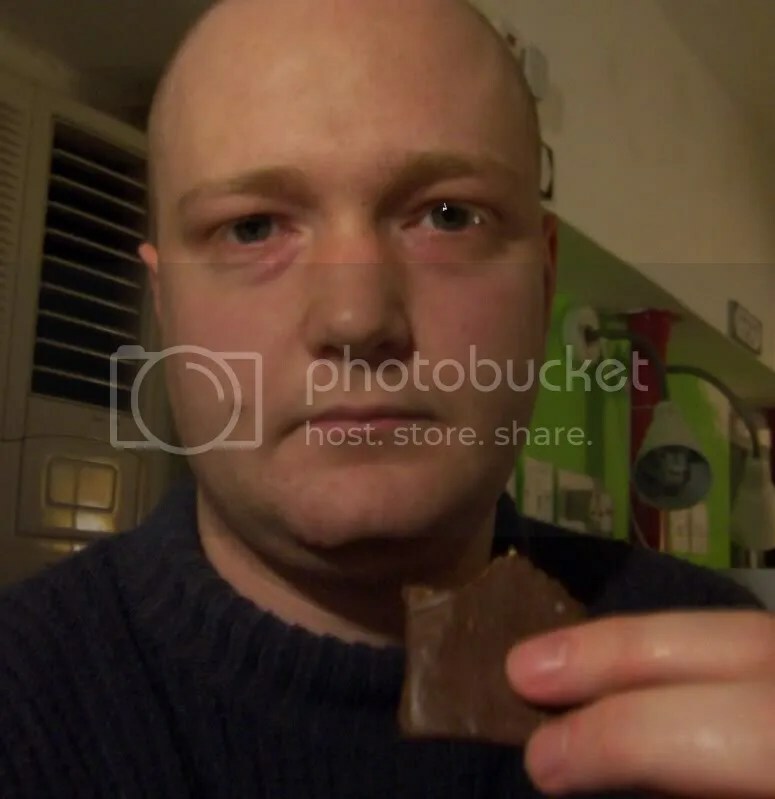 In 2008 I ate a few odd things, took photos (and in one case a video), so over the next few weeks I’ll put them up, and possibly there will be some more a little later. Next year I’ll be staring a proper Chinese food series, so I wouldn’t expect these to become a regular thing again. I was in visiting Hong Kong a couple of years ago when I somehow got hold of some kimchi chocolate. Kimchi is Korea’s national food. I had thought it was just spicy fermented pickled cabbage, but apparently many other ingredients can go into it, including radish and cucumber. Koreans seem to eat it with every meal, and this has influenced my generally poor impression of Korean food. As a probably unfair generalisation, they seem to have only two flavours; spicy and not spicy. 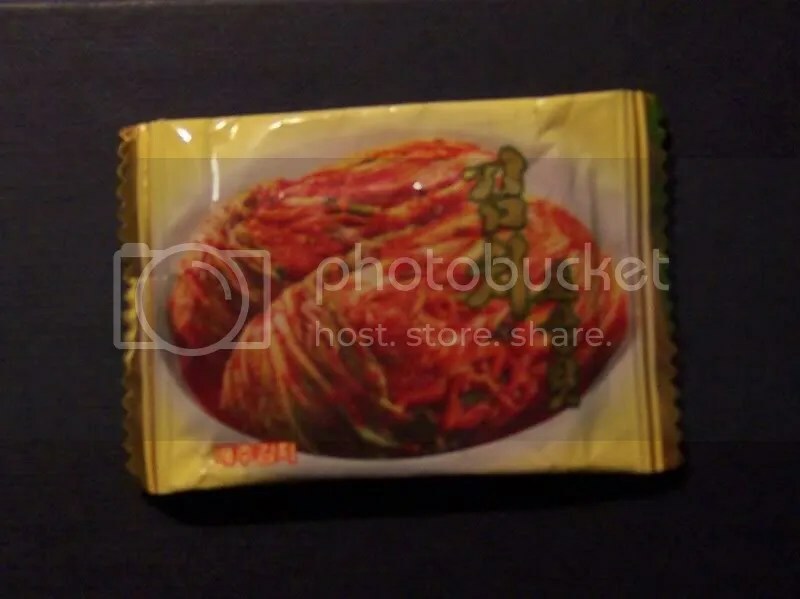 Kimchi, as a member of the former food group, seems to me to be the pickled vegetable version of tabasco sauce – spicy without possessing any other particularly interesting flavour. Kimchi chocolate, though… well, worth a try, though the picture on the packet looked more like diseased meat than cabbage. The chocolate inside didn’t really look any better. Putting the state of the chocolate to one side for a moment, the luminous colour of the supposed “kimchi” inside was both a warning sign and a comfort. 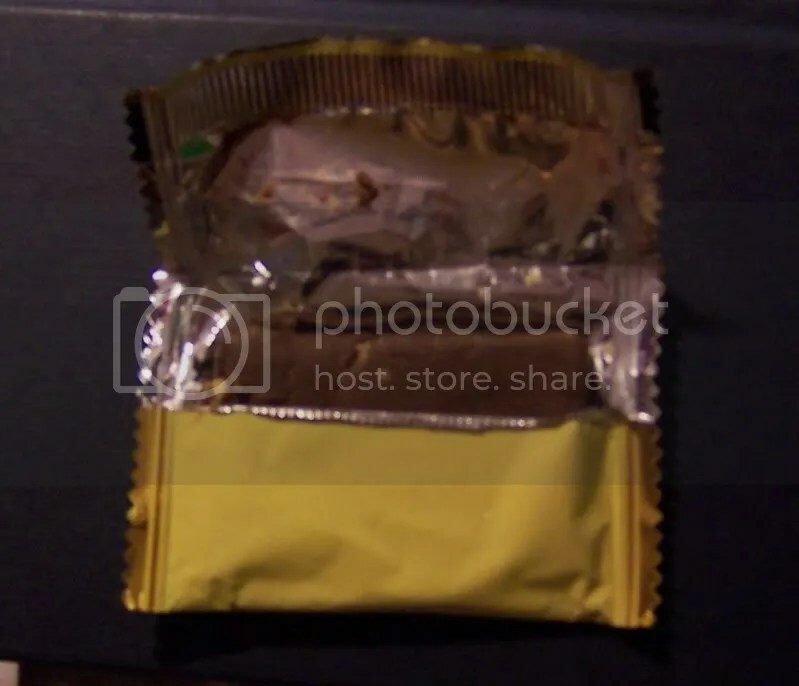 Whatever it was in there, it probably wasn’t real, authentic kimchi. It was much more likely to be a supposedly kimchi-flavoured fondant creme. So not much of a challenge here. Warning! 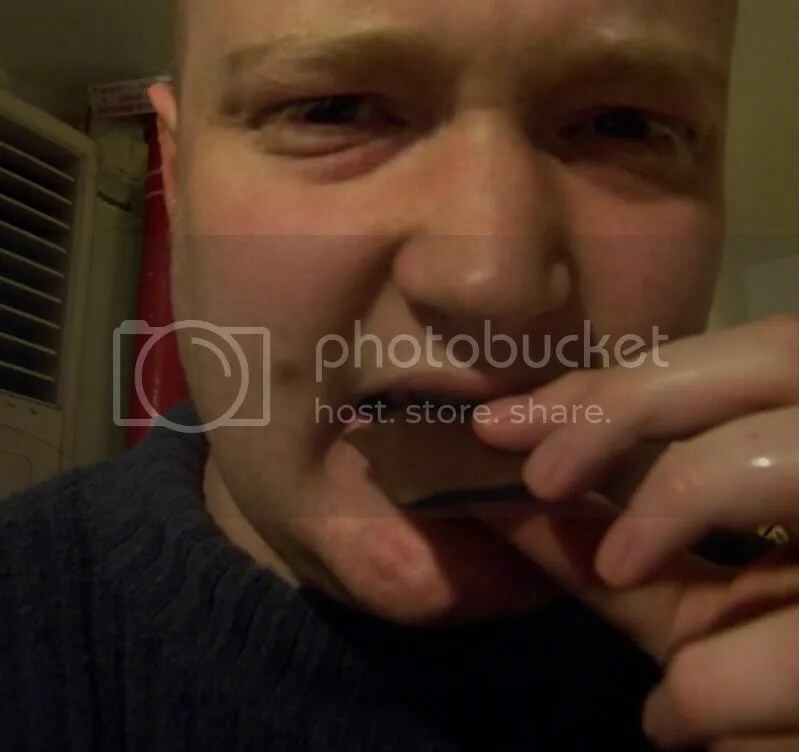 The following photos show me in early 2008, when I seem to have been quite overweight and missing a few nights’ sleep. A bit like Uncle Fester, but without the cheeky grin. Those of a sensitive disposition may want to look away now. As anticipated the snack was a letdown in all possible ways. The chocolate was cheap, nasty and soapy (as most Chinese chocolate tends to be), but not offensive enough to be interesting. The filling, well, it seemed to be more than just fondant creme, but still lacked any sort of interesting texture or flavour. It was a little spicy, but to such a minor extent that I had to wonder why they’d bothered. If it had been better it would’ve been edible, if it had been worse it may have been interesting. But it wasn’t. It was just crap. Recent experiments have taught the world that chocolate can be spicy, salty or bitter and be improved by the contrasting flavours, and of course other combinations may be equally stimulating. But where there are people interested in trying new things, there rubbish cash-ins shall follow. This entry was posted in food tube and tagged weird food. Bookmark the permalink.